Certain flavors lend themselves well to being featured in a hot, caffeinated beverage. Chocolate? Pumpkin spice? Maple pecan? They all pair well with frothy dairy and espresso. 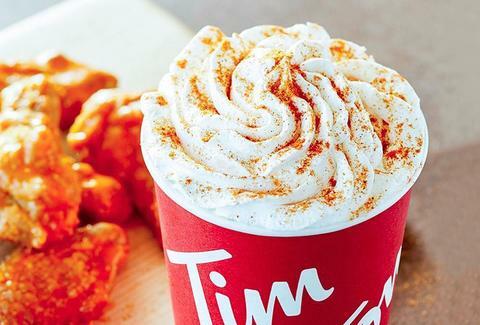 So, it may come as a surprise that a cult-favorite coffee chain has thrown that whole concept out the window with its latest offering: a hot wing-flavored coffee drink called the Buffalo Latte. To celebrate its new line of espresso drinks, Tim Hortons has unleashed the unconventional hot beverage on October 12, which is made from freshly brewed espresso, steamed milk, mocha, and "bold Buffalo sauce flavor." It's finished off with some whipped topping and a dusting of "zesty Buffalo seasoning." Whether or not you're meant to stir in blue cheese dressing with a celery stick remains unclear. Unfortunately, if you're adventurous enough to try one, you'll have to get yourself to Buffalo, New York -- the birthplace of its eponymous wings -- since it's only available at Tim Horton's locations in that area while supplies last. If you're not ready to stomach a hot wing latte, the company is hoping you'll at least try out one of its other new (and objectively more appetizing) premium espresso offerings, which include everything from americanos and cappuccinos, to caramel, mocha, vanilla, or pumpkin spice lattes.